“Norm!”… I mean … OBJ! Sorry about the old Cheers reference (and if you don’t know what I’m talking about, pretend I’m talking about Dawson’s Creek or something. Wait is that still cool? ), but OBJ’s fame reminds me of how everyone knew Norm. But how long will every know OBJ’s name? Well let’s see if it’s going to be “All the way with OBJ” (which, by the way, was Lydon B. Johnson’s Presidential campaign slogan — who says you never learn anything from my articles? ), or “No way OBJ” (which is part of what my nutritionist tells me when I ask if the 20 scoop Vermonster sundae from Ben & Jerry’s fits into my diet, minus the OBJ part of course). Could Odell’s rookie year be the start of a Hall of Fame career? Well, remember Chad Ochocinco, aka Chad Johnson? He’s a former NFL wide receiver currently playing with the Montreal Alouettes in the Canadian Football League. (But, his story is long, sad and for another day. And yes, there is actually a team called the Alouettes. And a country called “Canada”.). 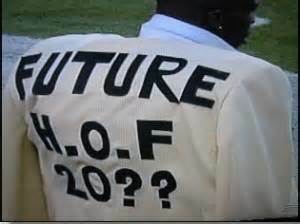 With an over-confident and self-important personality, Chad Ochocinco can be remembered for his “HOF” or Hall of Fame jacket. As you can guess, at age 37, the only way Chad Ochocinco Johnson will get into the Football Hall of Fame is to visit Canton, Ohio and pay his $24 admission fee. Name: Odell Cornelious Beckham Jr.
Odell Beckham Jr. played for Team Irving in the the Pro Bowl, replacing Calvin Johnson (due to injury). 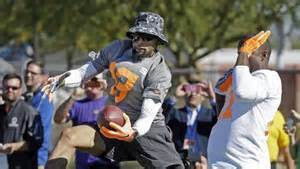 During practice (what, they actually practice for the Pro Bowl — could have fooled me), he showed off his famous one-handed catch. Gronk has his spike. OBJ has his one-handed catch. I’m sure it won’t be long before women start asking him to catch rose bouquets one handed. And yes, that was a reference to my article on Gronk. Don’t you wish you read that article? Oh wait, it’s still available! Lucky you. During the pro-bowl game, OBJ impressed with five receptions for 89 receiving yards. And during that same week, OBJ accepted the challenge and broke the previous Guinness World Record by catching 33 footballs with 1 – hand – in – 1 – minute. What? You can’t do that? Try some stickum on your gloves. Don’t worry, according to Jerry Rice, it’s only “a little illegal” to use stickum, so…yeah, it’s cool. I won’t tell. OMG, something negative about OBJ? Could this be the beginning of the end? Yup, you guessed it, OBJ had some bad boy moments on the field and drew the ire of the refs. In Week 16 on Dec 21, 2014 against the St. Louis Rams, OBJ was fined $10,000 for his participation in sideline fist-a-cuffs. Don’t you love the word fist-a-cuffs? Just rolls off the tongue. Wait, is that even how you spell fist-a-cuffs? Hold on, does anyone even use the word fist-a-cuffs? Fist-a-cuffs. Sorry, just had to say it one more time. 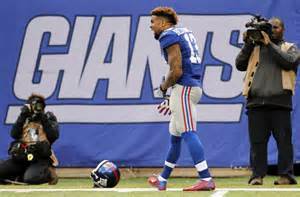 Anyway, in Week 17 on Dec 28, 2014 against the Philadelphia Eagles, OBJ was fined $11,025 for unsportsmanlike conduct when he threw off his helmet in a fit of anger in the second quarter. The Giants lost 34-26. Hey, I was angry too. Week 17’s fine is an example of how “green” Odell Beckham Jr. is in the NFL. He might have been extraordinary during the season, but he’s still a rookie. 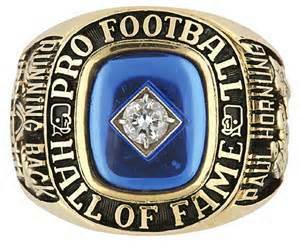 Games will always be won and lost, its how you handle the losses that make you a Hall of Famer. Tennessee Titans offensive tackle rookie Tayler Lewan was fined $8,268 for his unnecessary roughness penalty against the New Orleans Saints. Tennessee Titans rookie line backer Avery Williamson was fined $16,537 for his horse collar tackle in the preseason game against the Vikings. Jacksonville Jaguar’s rookie line backer Telvin Smith was fined $22,050 for an unnecessary roughness hit on Texan receiver Andre Johnson. Cleveland Brown’s rookie line backer Chris Kirksey was fined $8,268 for a forearm to the Quarterback Jake Locker. …But since OBJ makes the most money out of any of these fined rookies (4-year contract for $10,406,198), I think he can afford the $22,025 penalty. I guess the lesson learned is that unsportsmanlike conduct and unnecessary roughness were all the “rage” in the 2014 season. Like every season. And like wearing white before Labor Day. What enables wide-receivers to make extraordinary catches…their hands, of course. The bigger the hands, the better the grip, the better ability to hold onto the ball. In his interview with Micheal Strahan, he credits his enormous 10” mitts to his parents. As I mentioned, OBJ credited his enormous hand size to his parents. But, it doesn’t just stop with his hands. Here’s some food for thought. An over-all grade of 7.00-7.49 “titles” a player as pro-bowl caliber player. OBJ went to the pro-bowl, but only got a grade of 5.9. Yeah, I know. Pure comedy. And if you want more laughs, feel free to check it out on NFL.com here. 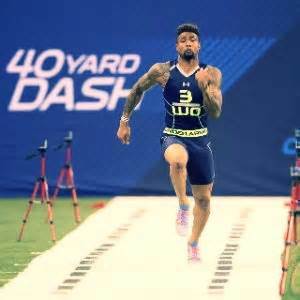 6) OBJ is not a man, he’s a . . . machine? OBJ missed the entire preseason and the first 4 games of the season due to a hamstring injury. After the pro-bowl game, he admitted that his injury never fully healed, but was managing to play through it. 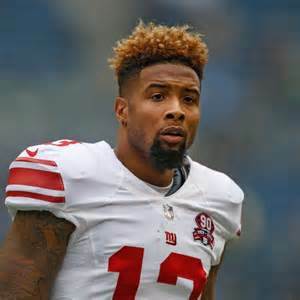 The Giants finished with a 6-10 2014 season, but OBJ finished the season with 91 receptions, 1305 yards and 12 touchdowns (leading the team in receptions, receiving yards and scoring, outside of Josh Brown, the Giants kicker). OBJ tied Hall of Fame receiver Michael Irvin’s NFL record with at least 90 yards receiving in 9 consecutive games. OBJ’s 91 receptions is tied for the second-most ever by a rookie. Only Anquan Bolden (101 in 2003) had more. OBJ is the first rookie in NFL history with four consecutive games with at least 130 yards receiving and a touchdown. Pretty impressive for a rookie still recovering from a hamstring injury. If he’s this good injured, how good will he be 100% healthy? 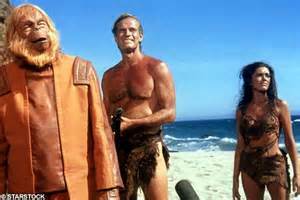 7) OBJ has a killer look. Need I say more. A hairstyle and goatee only OBJ can pull off. 8) OBJ can rock a scandal. Since we’re all nosy, and I know you are since you’re reading my article, we all want to know who celebrities are dating, whether their counterpart’s are famous or not. But, you know you hit the “BIG TIME” when people want to sleep with you and marry you and the first you hear of it is on Tinder. 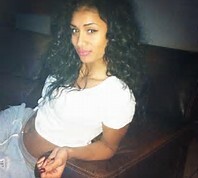 “Stephanie 19” went on matchmaking mobile app, Tinder, and said she [editor’s change: “had intimate relations with”] Odell Beckham Jr. posting the above picture as “proof” so she could market herself for future “hook-ups.” Who was her demographic? Women and men who want to be “Eskimo Brothers” with OBJ? And if you don’t know what an “Eskimo Brother” is, you should be watching more of the League. Erica Mendez went and told everybody she was engaged to the offensive rookie of the year, doing interviews and showing text exchanges between the couple. After OBJ denied knowing Mendez and stated that an investigation would be pursued, she suddenly disappeared. Or, did she? If you ask me…I think Erica Mendez came from an alternate reality where she was dating Odell Beckham Jr, and where he was into threesomes, and where he was a cheating douche. Mendez didn’t disappear, she just slipped back into the alternate reality…you know where apes rule the world and humans are slaves. Or maybe none of that happened and she’s just lying. Whatever. 9) OBJ can dunk a basketball. If football doesn’t work out, he can always try out for the NBA. I’m certain they’d give him a look. 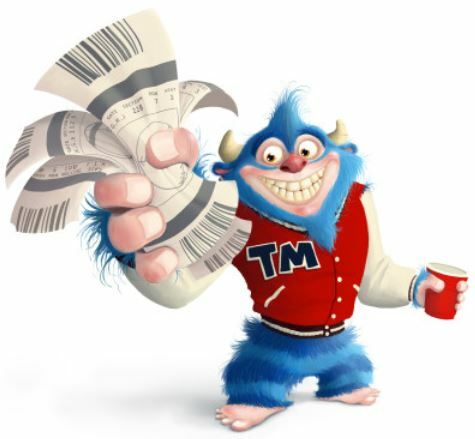 Or perhaps he can go into marketing. Visit OBJ’s site to buy some OBJ swag. 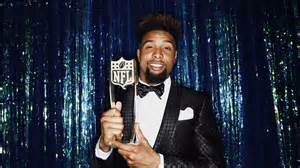 When OBJ was 4 and playing in the yard, he told his mother that he was practicing for the NFL. Later, he told his father he wanted to be a legend. In OBJ’s interview with Strahan, he mentioned that he’s inspired by people who said he couldn’t do something. OBJ wanted to prove to them that he could. At 22, Odell Beckham Jr. has already hit the “BIG TIME”. Heck, he was wrongly rumored to be engaged, has set a new hair trend, bought a Maserati and has a dog name Tzar. Who wouldn’t want a dog named Tzar? Chad Ochocinco plays for a canadian team? Always wondered what he was up to besides getting kicked off celebrity apprentice this season. 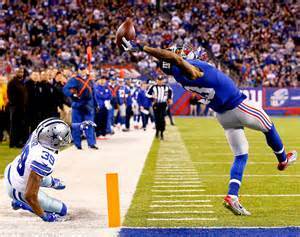 On another note, enjoyed the summery of OBJ after that incredible one handed catch in the game against Dallas.